Sparky and I both LOVE Crab Stuffed Mushrooms and baked Artichoke dip. We hadn’t had either one in a while so I decided to get busy and treat ourselves to something really yummy. Then, while I was pulling out all the ingredients, I paused, looked down at the Mushrooms, then at the Artichokes and then there was this moment of Epiphany! The clouds parted and sunbeams shone down from the heavens. Oh yes! 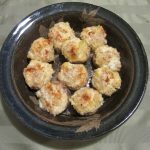 I can combine everything and make the most awesome Crabmeat, Artichoke Dip stuffed Mushrooms that are just to LIVE for! Just in time for the Holidays, I give to you this fabulous, easy, not gonna be one little smidgen left, stuffed SROOMS! 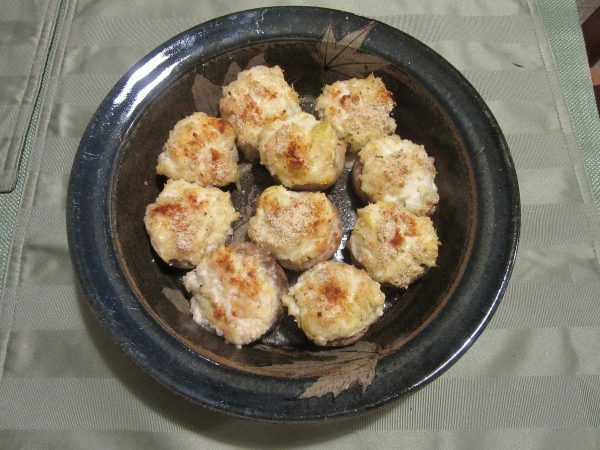 I made a dozen stuffed Mushrooms then put the remaining dip in a baking dish and baked it to a gorgeous golden brown and used it as a spread for buttery crackers. Sparky ate it all in one sitting! 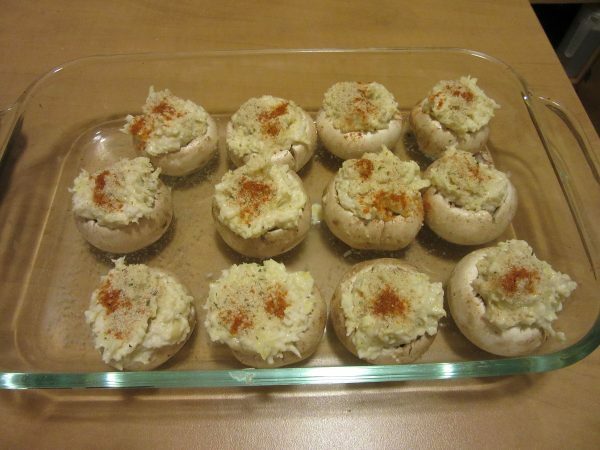 Guess he liked it 🙂 You can easily make 2 dozen stuffed Mushrooms with it. 1 14oz can water packed Artichoke Hearts good quality. I learned my lesson when using a cheap brand that were tough as nails! 1 Cup Salad Dressing like "Miracle Whip." Paprika to shake on top. Forget that "rule" about not rinsing Mushrooms because they get soggy. I have rinsed Mushrooms for the past 40 plus years and I can honestly say I have never had a soggy 'Shroom. So rinse away and wipe dry with a paper towel. Remove the stems and save them for another day. I place them in a freezer bag to use in my next batch of soup. Place the Mushroom caps in a baking dish. I used my old standby, the 11 x 7 Pyrex then set it aside. 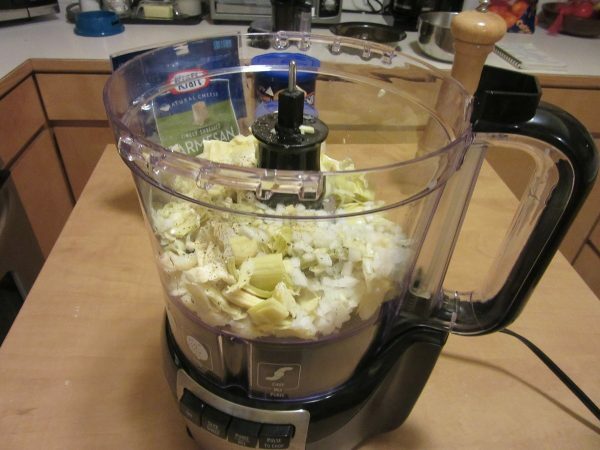 Place the Artichoke hearts, Salad Dressing, Parmesan Cheese, and Onion in a food processor or blender. Process just until combined and spoon into a medium size mixing bowl. 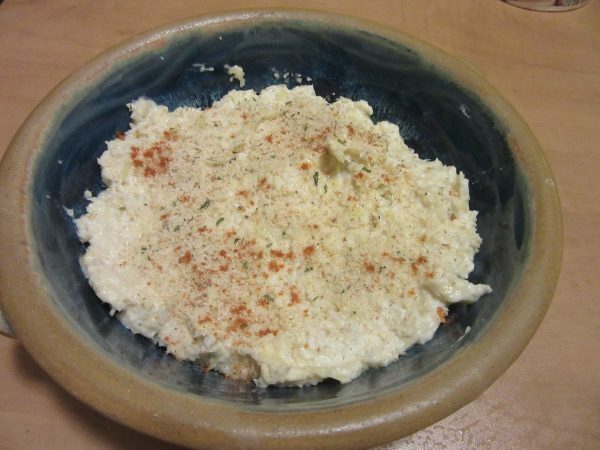 Drain the Crab meat, flake it and add to the Artichoke mixture. 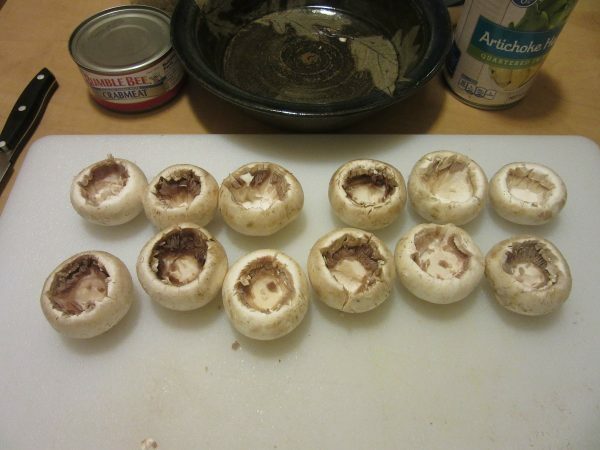 Either use it all to stuff the Mushrooms or take half of it out and place in a small baking dish. Spoon 1-2 tsp of the Crab-Artichoke mixture into each Mushroom cap. Sprinkle each stuffed Mushroom with about 1/4 Tsp Seasoned Bread Crumbs. 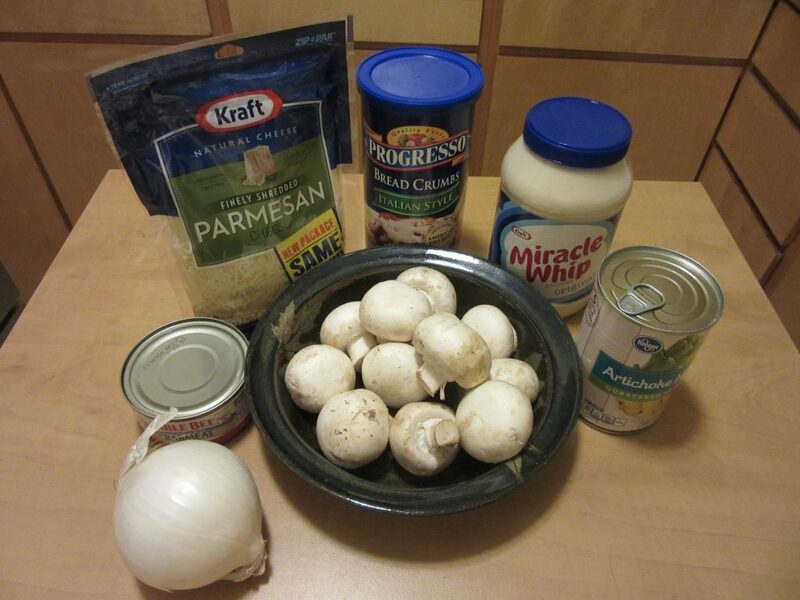 Add a dash of Paprika to each Mushroom. Add about 1/4 cup water to the baking dish. Then place in a pre-heated 350 degree oven. Bake for 30-40 minutes until golden brown and serve. 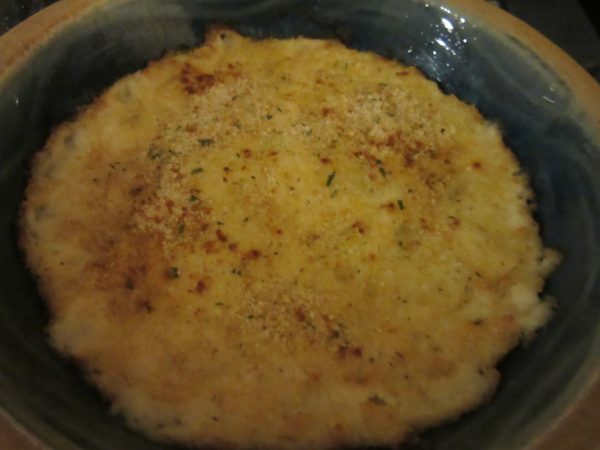 For the "unstuffed" variety,place in a baking dish, sprinkle with bread crumbs and Paprika. Then place the baking dish in the oven and bake as above. Now...just plate them up, put on your smile and graciously say "Thank you" when you are heaped with praise. Dan and I want to take this time to wish all of our friends here at The Journey Girl, a wonderful Thanksgiving. Whether you are a gathering of 2 or 20, enjoy your day. Whether you stay home or are traveling over the river and through the woods, we are thankful for your friendship and support! Oh Karen, these look Devine. I’ll have to make them. Thank you!